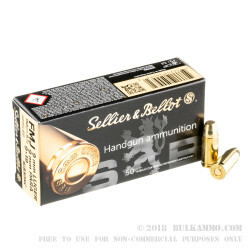 Heavyweight 9mm Luger loads like these from Sellier & Bellot are useful for a few reasons and can answer many of the issues in your training revolutions. 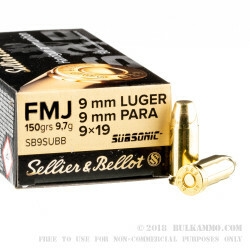 To start, this cartridge profile utilizes a 150-grain FMJ (Full Metal Jacket) projectile which some shooters may find better for cycling their transferrable submachineguns or semi-auto sub-gun builds. The heavier bullet is also loaded to move at subsonic speeds which precludes supersonic crack for the quietest performance when combined with suppressors. 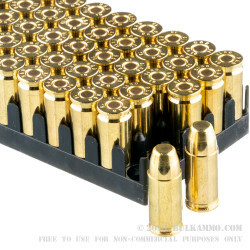 Another benefit to heavyweight training loads like these is that they more closely match the recoil impulse of expensive self-defense ammunition and facilitate relatively cheaper practice. The FMJ bullet is shaped with a rounded ogive for snag-free feeding and a flat tip for proper fit in magazines; the flattened nose also leaves nice circular holes in targets for easy score-counting and group measurement. 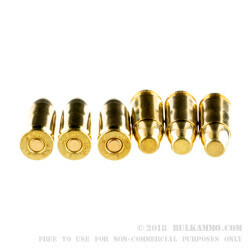 Each bullet is crimped into a reloadable brass casing that is fitted with a non-corrosive Boxer primer; the non-caustic ignition formula means that no bore-corroding substances will befall your favorite firearm. Sellier & Bellot, or S&B for short, is a Czech company that has been around since 1825. Their products are used around the world for sporting purposes and law enforcement activities without fail.